So anyway... In this second installment of the Guardians of the Galaxy, the team is already fully established as 'the guardians'. At the beginning of the movie, they are on a mission of protecting the Sovereign's batteries from a monster who is trying to stole them. They succeed and in turn of their service, the Sovereign hand Nebula over to them. She had become a prisoner after trying to steal the batteries. The Guardians then flee, but unbeknownst to the rest of them, Rocket stole some of the batteries. On their way home, they are attacked by the Sovereign's fleet but they are saved by a stranger. Turns out, the stranger is Peter Quill's estranged father, Ego the Living Planet. He asks Peter to come home with him to his planet. Peter is skeptic at first, but Gamora convinces him, so Peter, Gamora, and Drax go with Ego while Rocket, Baby Groot, and Nebula are left to fix their broken ship. The Sovereign is still looking for them and they recruit Yondu and his crew to find the Guardians. But then Yondu's crew betray him and a mutiny breaks out. 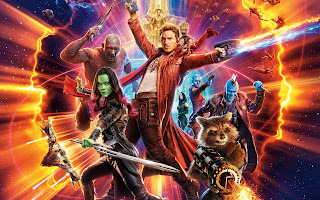 Yondu, Rocket, Baby Groot, and Kraglin (one of Yondu's loyal men) team up to escape, while the rest of the Guardians find out who Ego really is and what he really wants. While Volume 2 is not a huge disappointment, I honestly still like Volume 1 much better. This movie suffers from the 'personal story' syndrome, something that has become quite a trend lately (I read about it somewhere but can't find the link to the article). The visual effects, the jokes, and the characters are perfect, but the story is a little bit off. Also, I haven't read any Guardians of the Galaxy comic books, but I've read in a forum discussion that Peter Quill's father in the comic books is not Ego the Living Planet, so maybe I should find out why the writer decided so. And I'm very curious how the Guardians will fit in the upcoming Avengers movie! Anybody else feels the same way? All in all, I'm giving this movie 4 out of 5 stars.